"Monster" is however chock-full of that particular sort of creatures who only seems to come out at night (pun intended if you're familar with their back catalogue). I'm not saying it's just as good or very similar but it's definitely their heaviest effort ever since Gene decided to have a cheeky sing-a-long in the style of "I Love It Loud". Announced to be the back-to-basic album in the seventies style, it's clearly not the entire truth. 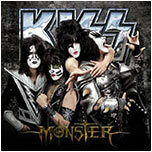 The production by Paul Stanley doesn't exactly reek of nostalgia and the same goes with the majority of tracks. "All For The Love Of Rock & Roll", no doubt the song that will remind you the most of the 70's era. It's the Nothin' To Lose number with Substitute-Cat behind the mic. Otherwise and overall like the continuation of Sonic Boom but in reality more towards Revenge and the hint of Hot In The Shade. Gene is dirty, rotten, filthy, stinking (rich?) evil and as soon as he rip into tracks such as "Wall Of Sound", "Back To The Stone Age", "Eat Your Heart Out" or "The Devil Is Me", the demon make this album his very own agenda, proving that not only did he graduate with honours from the school of hard knocks, but that simplicity always works the best. It's hardly rocket science and his part is indeed the dull metal monster with no time for softies. Rumbling chunky bass-lines and he sings better than ever on these tracks. 'Hell or Hallelujah no matter what you do I'm runnin' through ya', Paul sings on the opening track and single. His songs are frankly not quite as catchy nowadays (or like his solo material) since it's more about power, energy, and groove. However, I like them all perhaps with the exception of "Last Chance". The variety of styles from the fore-mentioned number to some of his other tracks makes it both interesting and slightly confusing. Jumping from the darker almost grungy rock of "Freak" to the pure party anthem of "Show Mercy" will leave the listener with a big grin and question mark on their face. It's clearly not the poppy side of Paul and it's more about metal this time around. Substitute-Ace is "Outta This World" with his best KISS song and nope, not a single ballad to be found. I still believe they could have included a couple of more sing-a-long anthems such as the Gene/Paul duet "Take Me Down Below", but it's a strong album effort and not really the "hits" of the 80's era.